I posted our latest Course Update here - https://incubator.duolingo.com/courses/sw/en/status - or you can read below! You've read it right! 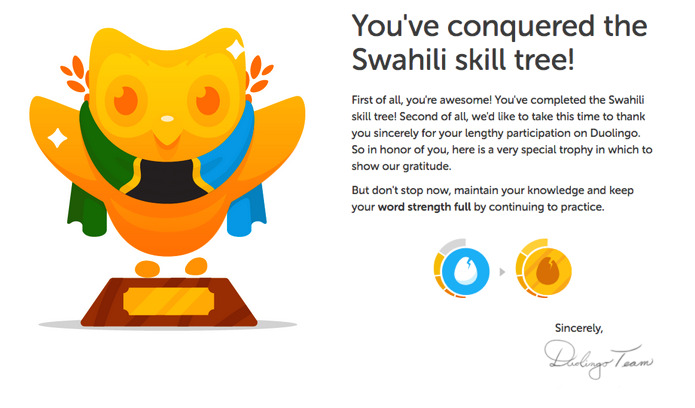 The Swahili-English course has now been released into a limited Beta mode! What does that mean exactly? Well, the course is now in Beta for web-based learners to go through. We are currently in the stages of working on the audio recordings for the course, but in the run up to some exciting stuff (more to come on this, but not from our end! ), the course is now in it's limited Beta mode for the public. So, with this limited Beta mode, please be aware that there are NO AUDIO EXERCISES - yet! This was not necessarily how we originally envisioned the course to be released, but trust me - the voice exercises are on their way. We'll need all of your help to make the Swahili-English course successful. Now that we have the watchful eyes of the entire Duolingo community, we're looking forward to any and all error reports to fix up some of the translations and errors. When you have a team of mixed backgrounds, some of the translations sound right in one language but not the other, and vice versa! While we've been working to fix some weird or unnatural translations, there are still a number that need to be edited. We appreciate all of your hard work in advance! As previously mentioned in an earlier Course Update, the Tips and Notes sections are vitally important for our course. We hope that they make sense, but if there are questions, please post in the Swahili discussion forums. The Tips and Notes sections will serve to help introduce grammar points before lessons and give helpful examples. Additionally, we're hoping to add more exercises to the skills in the event that some lack some "meat" as well. This update's proverb literally translates as - "If you are going to eat pork, choose the fattest pig!" This essentially means "Go big, or go home!" We're hoping that you'll all enjoy the Swahili-English course in full! Yup! We definitely want as many reports as are necessary - don't feel bad! I really hope you don't mind that many reports I'm sending your way, pretty sure some of them are even wrong!(Sorry!) I try to deliberately put the weirdest correct answer possible, to see if they get accepted. Brandon, it would also be helpful if you guys would consider in the future to create an English learning course for Swahili speakers. I have plenty of students here who need to learn proper English, and they are not getting it in the schools from teachers who do not know English well themselves. Also, please forgive me if some of my reports are harsher than I intend. Some of the mistakes are surprising to have made it into Beta stage. For example, in the Numbers category, in order to get "thelathini na moja" correct, you have to write "30 one." Please let me know if I can assist in any way. I am happy to help, but my Swahili is far from perfect! Hi Branden. I am noticing a lot of errors in the English translations, too few acceptable answers in English from Swahili (when the Swahili can mean a small range of things), errors in counting, etc. I have been reporting as I find them. Some of them may have to do with the differences in Tanzanian and Kenyan spoken English, as opposed to American or British. For example, for American English speakers, it is improper to refer to "matunda" as fruits in a sentence, while that is the literal meaning in Swahili. Fruit is both singular and plural in English. I am hoping to encourage you but am hoping also that corrections are made well to move this much needed course along! Thanks for your work! Very thankful for this opportunity! My parents worked in Kenya and Tanzania before I was born (as well as my father and sister when I was abroad in Poland), and, as a result, I'll be able to connect to a piece of my family story I haven't seen yet! Looking forward to reaching level 25 one day! I'm so exciting to learn Swahili! Thanks Swahili team!! Woooohooo! I've been dying for this course. I bought the only books on Swahili at my bookstore two months ago. Thank you guys and a massive congratulations to team Swahili. Awesome, I'll give it a try! Plus, I can't get over how cool the flag looks! A huge thank you to the whole team! Karibu kiswahili! I'm so happy a Bantu language can be included on Duolingo. how, we no longer have immersion? Which is why that sentence was in the past tense. Swahili is such an exciting language and the course is super fun so far. Thank you so much for the time and care that went into this! I have been excited about Swahili for ages, and I've done the first skill, I'm surprised at how intuitive it is, I don't think I'll be focusing on it quite yet, it's not in my schedule until a bit into march, but it makes me very happy to see it. Once the audio is put in, the course will definitely feel more alive, too! Many things do become intuitive, but that is quite true of all languages :-)! Asante sana for all your hard work. Very excited to start! Lovely course! I've been looking forward to since it entered the incubator, so very happy. I love the look and feel of the language. Anymore on the exciting stuff:)? I wish I was at liberty to say! I have to say, the Swahili owl is great! I'm tempted to test out and finish now, but what would be the fun in that. I can't wait to get the owl for myself! :) Swahili is a very lovely language, with such rich history. Even though the owl is just a symbol it's striking with the flag-scarf colors. I'm just working through the course today, one think I'm finding frustrating getting Q's wrong for using 'a' or 'the' different to how it's written in the answer. E.g. 'nilisoma kitabu' could be 'I read a book' or 'I read the book'. Sipendi ugali could be 'I don't like ugali' or 'I don't like the ugali'. These should all be accepted in any combinations since Swahili is ambiguous in this sense. At the very lease it should be consistent in the answers provided. Whenever your answer is marked incorrect when you feel like it shouldn't be, please use the "report a problem" button and select "my answer should be accepted". This will send a message to the course creators who will review your answer and add it as a correct option if it's correct. Exactly! The reports help me comb through the exercises to make sure that the articles are there for English, though they do not exist in Swahili! Ok, thanks. I will report each one now. This course is pretty good so far! I will try to finish it all in a few days (if not today), then go back and actually learn it. Thank you for your efforts on this course! Attempting same, though I think it will be tricky. Still, by the time I've blitzed through it I'll hopefully have subject prefixes down so I can focus on the rest of it on subsequent runs. Thank you guys so much for this course. I've been dying for it and I'm really happy!! Great news, a big thanks for all the contributors! August 12. When might we expect Swahili audio? Planning some volunteer work in Africa early next year and hope to have some basics. Many thanks. We’re now 6 months further.... Any news??? Would really be nice and helpful to have audio! Whoops, just commented with that very question. I see I’m not the only one waiting anxiously for the audio. Hi Guys, try these two Swahili AUDIO FLASHCARDS with English translations. 200 Swahili common phrases with Audio Flashcards. You can download on your pc and sync with your phones : https://ankiweb.net/shared/info/70653193 and https://ankiweb.net/shared/info/929835171 Enjoy! Hey, just wondering when the audio for the Swahili course might be uploaded? Browsing about and noticed that the Swahili tree is here! Only just noticed it although it is a few weeks old - happy 3-week birthday, Swahili course! This is just so exciting. I see there already duolinguists who have finished the tree and reached the high levels. Respect! Huge thanks to the Swahili team, what a huge undertaking, and good luck with the recordings. It is magic to see such a project take flight. Asante sana! You mean in the sense that it doesn't have audio?